The competition started with the brand new Chinese team Team Ice Pearl. The team did an incredible performance when we know they started skating together in synchro just nine months ago. Encouraged by the audience, their "Maybe I Maybe You" program earned them a total of 29.98 points. In their glittery gray costumes, the Swiss Starlight Team did their first steps on the ice of the World Championships. The skaters delivered a clean program skating to the title "Closer" (40.13 points). Representing Croatia, Zagreb Snowflakes warmed the rink with their Italian Mambo. The team totaled 38.45 points. In very original costumes with multiple colors, Team Amber surprised the audience with its short program. The Latvian champions had to count with two falls in the corner intersection. They collected 28.40 points. Team Vizyon from Turkey skated a free program that was both melancholic and intense. Thanks to a clean performance, the Ankara athletes totaled 32.88 points. The audience clapped their hands to encourage the Austrian team Sweet Mozart. Despite some small hesitations, the girls coached by Noora Karjalainen earned 33.63 points for their "Rhythm Inside" program. The second group opened with the Czechs Olympia who skated confidently to a traditional music. The program went like a crescendo to finish with a lot of energy and humor. Katerina Urbanova's team received 52.35 points for their short program. Team Unity (AUS) presented a beautiful interpretation of the music "Call Out My Name". The team knew how to interpret every little change of music. In gray costumes, the team totaled 40.93 points, which ranks them right in front of the Swiss. The rink then vibrated with the performance of Icicles Seniors representing Great Britain. The team skated a very strong program on "Sax" with however an error at the beginning of the program. The new team won 35.74 points. The new Canadian team Nova has entered the Finnish ice with its famous energy and creativity. The team coached by Marie-France Sirois presented an excellent short program and obtained the highest total points received so far: 82 points! The Team Phoenix form Belgium skated just after a jazzy performance. 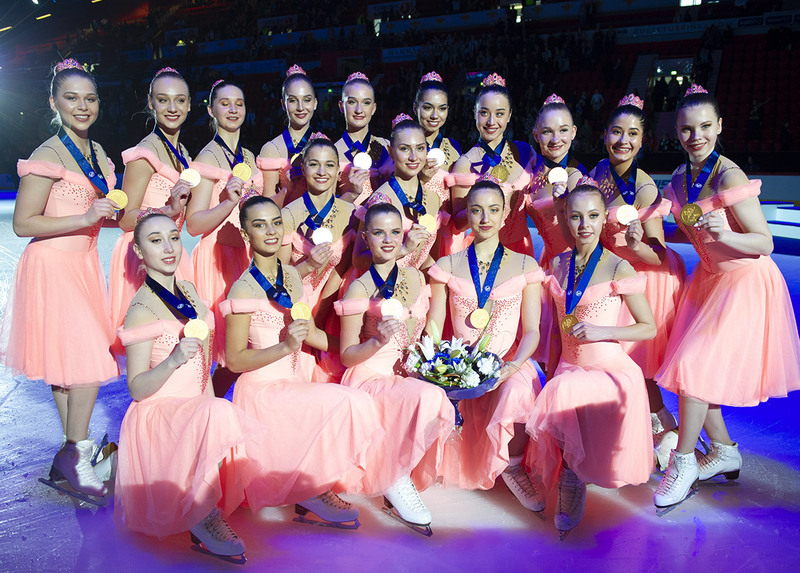 Wearing blue and orange dresses, the athletes were able to count on a total of 38.73 points for their short program. The second group ended with the dynamic performance of Japan's Jingu Ice Messengers. Their program was very rhythmic, adapted well to the energy of the team and earned them a total of 56.98 points. Team Illumination from the Netherlands has opened this group with a clean program with soft and wordless music. The team earned 37.77 points for the short program. Sweetness and elegance... The Italian Hot Shivers fascinated the public with their skating qualities. The team presented for example a beautiful block that pivots while holding on the wrist. Leaving the ice, the Italians showed their emotion. They had a very good score of 61.88 points. The audience was so loud when the Helsinki Rockettes arrived on the ice. Thousands of flags fluttered in the stands of the stadium. Under the shouts of the spectators, the national champions presented a good short program despite a fall in a transition. They are finished with a total of 82.12 points. For Hungary, Team Passion has skated to "Survivors" without major error. The team performed with power and totaled 49.22 points. 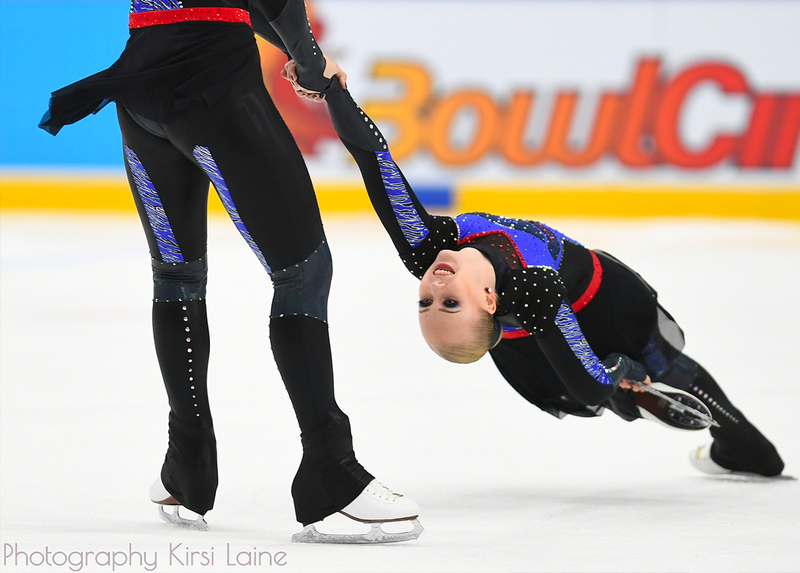 Representing the United States, the Skyliners shined in Helsinki for their second participation in the Worlds. The team led by Josh Babb achieved a clean and speedy performance. And Skyliners won 76.23 points. It was then the turn of Les Zoulous to compete. The team was split in two by different color suits: black and white. The French showed a very intense performance and with a beautiful interpretation of the music despite a fall at the end of the block. Their short creative program earned them 53.75 points in total. It is with great energy that Team Berlin 1 has started its short program. A first fall appeared just before the intersection and a second followed soon after. The German champions received 56.02 points. Team Paradise then skated his short program on Frédéric Chopin's Nocture music. The Russians performed extremely well and scored 87.12 points, the highest score of the night. Then the crowd rose again and waved flags for reigning World Champions Marigold IceUnity. Anu Oksanen's team skated their #WhyNot program in a very clean way. The Finnish team got a total of 85.90 points. In the stadium, a screek showing the decibels is displayed in the middle of the rink. For Marigold, the level has reached 100 db, just to realize it?s like the sound of a jackhammer! Team Tatarstan of Russia then skated their "Ave Maria" in front of the Finnish public. The skaters performed their short program with grace and incredible precision in volatile blue dresses. The Russians scored 82.83 points, just ahead of the Helsinki Rockettes and Nova. As for their compatriots, the American public encouraged the Haydenettes, the national champions in the United States. The elegant team did a clean program on Cirque du Soleil music, earning a total of 77.97 points. An end in apotheosis! Nexxice of Canada closed the first day of competition. Their Latin style program took the audience and the judges into a beautiful atmosphere. The team from Ontario won a total of 84.63 points and finished with third place. After the short programs, only five points separate the top six teams in this competition. Everything will be still possible on Saturday afternoon with the free programs! Follow this competition on Jura Synchro. All live scores are published on Instagram stories!